Property Size 675 sq. ft. Newly Listed Condo! This 4th floor condo is an end unit with gorgeous views of the gulf. It is a 1 bedroom plus bunks with 1.5 baths. Perfect for a family, ! You can enjoy a cup of coffee or a glass of wine of the balcony overlooking the Gulf of Mexico. The location is fabulous with all the shops and restaurants within walking distance. Beach access is across the street and you can enjoy any of the 3 pools and hot tub that are available within Gulf Place. 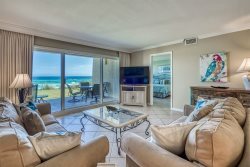 Access to the white sand beaches and emerald gulf waters with Gulf Place Private beach access directly across the street or enjoy Cabanas community pool , perfect for a quick dip. Gulf Place Cabanas are just steps away from a variety of restaurants, boutique shopping, and the Artists colony to browse for that unique keepsake. The 'Lawn' offers live music concerts in the season, right at your back door. Live music can also be enjoyed at the corner restaurants! No need for a car during your vacation! Hwy 30A offers a scenic path covering it's 18.5 miles for walks, jogging, or biking. Enjoy 27 miles of Greenway Trails for hiking/biking, explore the 11 coastal dune lakes or the 4 state parks, all within a bike ride away! Call to book your "Beach Escape" today! Master Bedroom with King Bed, Queen sleeper sofa, and bunk beds. Shopping and Restaurants within walking distance, Golf nearby! Add $100 for housekeeping and 11% for tax. $69 damage protection; $30 booking fee 2.09% to process credit card payments. 25% of the total is due at booking and will hold the unit for you. The remaining balance is due 30 days prior to your arrival.